1. Cut the chicken into bitesize pieces. Put into a bowl with the marinade ingredients, season and mix well. Cover and chill for at least 2 hours, or overnight. 2. Heat 1 tbsp of the oil in a large casserole. Remove any excess marinade from the chicken and pat dry with kitchen paper. Fry the chicken in batches for 5 minutes, adding a little more oil if necessary, until golden. Remove and set aside. 3. Return the casserole to a medium heat, add the remaining oil, onion, spices and bay leaves. Fry for 8-10 minutes, until the onion is golden. Return the chicken to the pan and cook for another 2 minutes until cooked through with no pink meat. Add the rinsed rice to the pan. Stir well, then spread in an even layer. Pour over the stock then season. Bring to the boil, cover and simmer for 10 minutes. 4.Add the broad beans and courgettes. Cover and cook for 5 minutes, then remove from the heat. Cover with a tea towel or 3 layers of kitchen towel and then the lid. Leave for 10 minutes. Stir the coriander, parsley and dill into the rice, leaving a handful to garnish. Mix the mint into the extra yogurt and season. 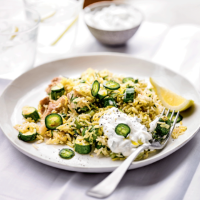 Serve the pilaf with the yogurt, green chilli and lemon wedges on the side.